23. Gaigeot, M.-P., Besley, N.A. & Hirst, J.D, Modelling the infrared and circular dichroism spectroscopy of linear and cyclic diamides. J. Phys. Chem. B, 115, 5562–5535 (2011). 22. Bulheller, B.M., Rodger, A., Hicks, M.R., Dafforn, T.R., Serpell, L.C., Marshall, K.E., Bromley, E.H.C., King, P.J.S., Channon, K.J., Woolfson, D.N. & Hirst, J.D., Flow linear dichroism of some prototypical proteins. J. Am. Chem. Soc., 131, 13305–13314 (2009). 21. Bulheller, B.M., Pantoş G.D., Sanders, J.K.M. & Hirst, J.D., Electronic structure and circular dichroism spectroscopy of naphthalenediimide nanotubes. Phys. Chem. Chem. Phys., 11, 6060–6065 (2009). 20. Bulheller, B.M. & Hirst, J.D., DichroCalc–circular and linear dichroism online. Bioinformatics, 25, 539–540 (2009). 19. Bulheller, B.M., Miles, A.J., Wallace, B.A. & Hirst, J.D., Charge-Transfer Transitions in the Vacuum-Ultraviolet of Protein Circular Dichroism Spectra. J. Phys. Chem. B, 112, 1866–1874 (2008). 18. Bulheller, B.M., Rodger, A. & Hirst, J.D., Circular and Linear Dichroism of Proteins. Phys. Chem. Chem. Phys., 9, 2020–2035 (2007). 17. Oakley, M.T. & Hirst, J.D., Charge-Transfer Transitions in Protein Circular Dichroism Calculations. J. Am. Chem. Soc., 128, 12414–12415 (2006). 16. Oakley, M.T., Bulheller, B.M. & Hirst, J.D., First Principles Calculations of Protein Circular Dichroism in the Far-Ultraviolet and Beyond. Chirality, 18, 340–347 (2006). 15. Rogers, D.M. & Hirst, J.D., First Principles Calculations of Protein Circular Dichroism in the Near-Ultraviolet. Biochemistry, 43, 11092–11102 (2004). 14. Gilbert, A.T.B. & Hirst, J.D., Charge-Transfer Transitions in Protein Circular Dichroism Spectra. J. Mol. Struct. (THEOCHEM), 675, 53–60 (2004). 13. Rogers, D.M. & Hirst, J.D., Calculations of Protein Circular Dichroism from First Principles. Chirality, 16, 234–243 (2004). 12. Rogers, D.M. & Hirst, J.D., Ab Initio Studies of Aromatic Side-Chains in Gas Phase and Solution. J. Phys. Chem. A, 107, 11191–11200 (2003). 11. Hirst, J.D., Colella, K. & Gilbert, A.T.B., Electronic Circular Dichroism Spectra of Proteins from First Principles Calculations. J. Phys. Chem. B, 107, 11813–11819 (2003). 10. Bhattacharjee, S., Tóth, G., Lovas, S. & Hirst, J.D., Influence of Tyrosine on the Electronic Circular Dichroism of Helical Peptides. J. Phys. Chem. B, 107, 8682–8688 (2003). 9. Hirst, J.D., Bhattacharjee, S. & Onufriev, A.V., Theoretical Studies of Time-Resolved Protein Folding. Faraday Discussions, 122, 253–267 (2003). 8. Andrew, C.D., Bhattacharjee, S., Kokkoni, N., Hirst, J.D., Jones, G.R. & Doig, A.J., Stabilizing Interactions between Aromatic and Basic Side Chains in α-Helical Peptides. Tyrosine Effects on Helix Circular Dichroism. J. Am. Chem. Soc., 124, 12706–12714 (2002). 7. Dang, Z. 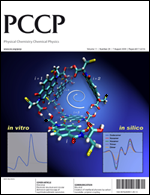 & Hirst, J.D., Short Hydrogen Bonds, Circular Dichroism and Over- Estimates of Peptide Helicity. Angew. Chemie Intl. Ed., 40, 3619–3621 (2001). 6. Besley, N.A. & Hirst, J.D., Hydrogen Bonding in Protein Circular Dichroism Calculations. J. Mol. Struct. (THEOCHEM), 506, 161–167 (2000). 5. Besley, N.A. & Hirst, J.D., Theoretical Studies toward Quantitative Protein Circular Dichroism Calculations. J. Am. Chem. Soc., 121, 9636–9644 (1999). 4. Hirst, J.D. & Besley, N.A., Response to »Comment on 'Improving Protein Circular Dichroism Calculations in the Far-Ultraviolet through Reparametrizing the Amide Chromophore'«. J. Chem. Phys. [J. Chem. Phys. 109, 782-788 (1998)], 111, 2846–2847 (1999). 3. Hirst, J.D., Improving Protein Circular Dichroism Calculations through Better Ab Initio Models of the Amide Chromophore. Enantiomer, 3, 215–220 (1998). 2. Hirst, J.D., Improving Protein Circular Dichroism Calculations in the Far-Ultraviolet through Reparametrizing the Amide Chromophore. J. Chem. Phys., 109, 782–788 (1998). 1. Hirst, J.D. & Brooks III, C.L., Helicity, Circular Dichroism and Molecular Dynamics of Proteins. J. Mol. Biol., 243, 173–178 (1994).